Part of what gives Michael Wadleigh’s 1970 documentary Woodstock its sense of purpose is the seemingly mundane footage of people walking. Several times throughout the Academy Award-winning film, shots stay on concert goers as they move in masses along the streets, through the gates, and barrel into the historic landscape with unified excitement, joined in a cause. The focus is not on the music playing beneath the frames, but rather the expressions of those in attendance, as if to say, at that moment, what mattered most was the experience. By letting these scenes tell the story, it made the music so much more powerful. It wasn’t a concert promoter building hype, or a talking head telling us what was going to happen. It was the childlike enthusiasm evident by the hurried way people rushed in with wide eyes and even wider smiles that made any explanation of the environment moot. Wadleigh and his editing team (which included Martin Scorsese and Thelma Shoonmaker) got it right. 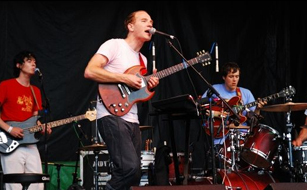 During Caribou’s July 19 set, Pitchfork Music Festival promoters got it right, too, for the same reason. The afternoon performance could not have been at a better time or on a better stage. By placing the atmospheric musician on the Connector Stage next to the main entrance, the Canadian’s haunting, scene-building songs worked as a first impression for thousands of ticket-toting music enthusiasts. Entering Chicago’s Union Park with the same gaze as many of those Woodstock faithful, Caribou’s 2 p.m. slot found itself as the backdrop for what was a popular arrival time during the fest’s first full day. Performing with a four-piece band and without on-stage visual effects, Dan Snaith built his 45-minute set into swirling, beautiful theater that kept many of those entering the event from wandering any further. Stopped mid-step, they moved little after the first note of the songwriter’s booming compositions. There, again, was that sense of purpose and unity that made Woodstock such a powerful movie. Thousands arrived together, and those same people were allowed to get lost in thought and anticipation for the rest of the day, as Snaith’s tunes scored their daydreams. Taking the stage about 10 minutes behind schedule, he apologized quickly and launched into “Sundailing” from last year’s exquisite Andorra. Even the skies opening and a momentary downpour didn’t hurt the exotic performance that saw Snaith rotating between playing xylophone and his recorder, and even picking up sticks as a second drummer. In fact, the shower added to the experience. As the clouds grew darker, the growing mob in front of the stage turned to a colorful sea of umbrellas, all but disrupting any clean sightlines. It was a powerful, unique visual, but also meant those deeper than the front row were left with only the music and their surroundings. What seemed like a movie score now was becoming even more so as it grew harder to catch a glimpse of the musicians. After barreling through about 10 songs, including the churning “After Hours”, Snaith and Co. scurried off stage to immerse themselves in the Pitchfork Music Festival ­­– but not after preparing thousands of rain-soaked hipsters to do the exact same thing.